Home » adjustable height desk » Will Adjustable Height Electric Tables Become the Norm? Many people ask us if adjustable height electric tables will become the norm in the future. While none of us can predict the future, we can make projections based upon current trends. These highly ergonomic and adaptable devices are becoming increasingly popular in offices across the United States. Originally, they were viewed as something of a novelty item. Many professionals saw these tables as something that belonged in open concept environments that “out of the box” thinkers would use. Since their introduction to the marketplace, however, these tables have earned a very high level of respect from designers and professionals in a broad spectrum of industries. The indisputable ergonomic benefits they offer, combined with increasingly competitive pricing and space saving advantages, all point to a future where we will be seeing these adjustable workstations almost everywhere they go. One reason for this is a heightened awareness of health and wellness that has swept the corporate world in recent years. Twenty years ago, most companies thought of health and wellness as cutting back on alcohol, quitting smoking, and watching your cholesterol intake. This understanding of health was severely limited, because it focused on getting rid of negatives and paid little attention to adding positives. However, the past two decades have broadened our perspective and our definition of wellness. Today’s companies know that when it comes to health, factors such as diet and exercise are even more important than the elimination of bad eating habits and chemical addictions. With this awareness, a new emphasis on ergonomics has redefined space planning. Comfort is no longer dismissed as an unnecessary luxury, but rather is extolled as an essential component for long-term profitability. Ergonomics can be considered the number one factor in the growing importance of adjustable-height electric tables. Today’s workers are still very much a part of a traditional work routine that heavily focuses on a sedentary way of approaching work. However, a good three-quarters of the workday is spent by employees standing, walking, or engaged in some other physically demanding task. An adjustable-height electric table would be just the solution to this problem. Millennials are now considered to be the largest generation in history. Now that they’re dominating the workforce, attuned to the many technological advances of their day, they’re also concerned with spending their time in a work environment that values the importance of good ergonomic form. Adjustable-height electric tables emulate that form, while employing an electric control panel for the ease of adjusting the work surface to just the right height in either a sitting or standing configuration. Ease of use is found through an electric control panel, offering individual comfort with just the touch of a few buttons. One of the most impressive things about an adjustable height electric table is the way to blends ergonomic comfort with physical exercise. Not only does it feel good to stand after an extended period of sitting, it IS good. Study after study has shown that workers experience less stress and physical fatigue when they can alternate between standing and sitting. Leg and back muscles are used more during the day to the extent that some people even lose weight after switching from standard desks to adjustable ones. 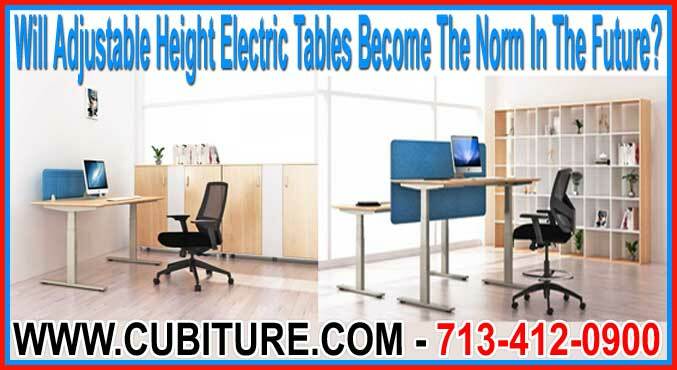 While we do not want to promote adjustable height electric tables as weight loss devices per se, it does bear noting that there are documented cases of people slimming down after a year of alternating between sitting and standing. Such instances show that not only are people better supported by such workstations, they are also less sedentary and therefore healthier than they were in the past. For space planners, adjustable height electric tables are also a dream come true. Space planners often run into very complex challenges in small offices where the existing staff has outgrown its surrounding environment. What most designers quickly learn, however, is that the problem is not the new people, but all the old furniture that is consuming way more square footage than the workers actually need to perform their jobs. This is because so many older pieces of furniture were built to support large desktop computers, giant monitors, and a multitude of peripherals and paper organizing trays. Yet more and more millennials—and Gen X and even Baby Boomers—are moving away from large desktops and doing all their work on laptops instead. This trend—combined with the continued push to become paperless—makes larger desk areas increasingly obsolete. If all a worker really needs is enough from for a laptop and possibly a secondary display monitor, then an electric adjustable height table doesn’t need to be all that large. Companies can accommodate more workers in the same amount of space with desks that consume far less square footage. We also expect the costs of electric adjustable height desks to continue to go down over the next few years. As with all forms of new technology, prices are initially high, then begin to steadily decline and supply begins to equal demand. It won’t be very long at all before even the smallest of small businesses can easily afford these exceptional workstations even on a shoestring budget. Cubiture is already on the leading edge of this affordability curve, offering adjustable desks and tables at prices few can equaly, and at a level of quality even fewer can approach. Call now for a free quote.